Get 30% off the entire store when you share one of our FB videos on your timeline, to your friends. You can view the videos below, and the link below the video will take you to Facebook to share your chosen video. PLEASE USE THE LINK BELOW THE VIDEO YOU PICK, AND NOT YOUTUBE’S SHARE BUTTON. 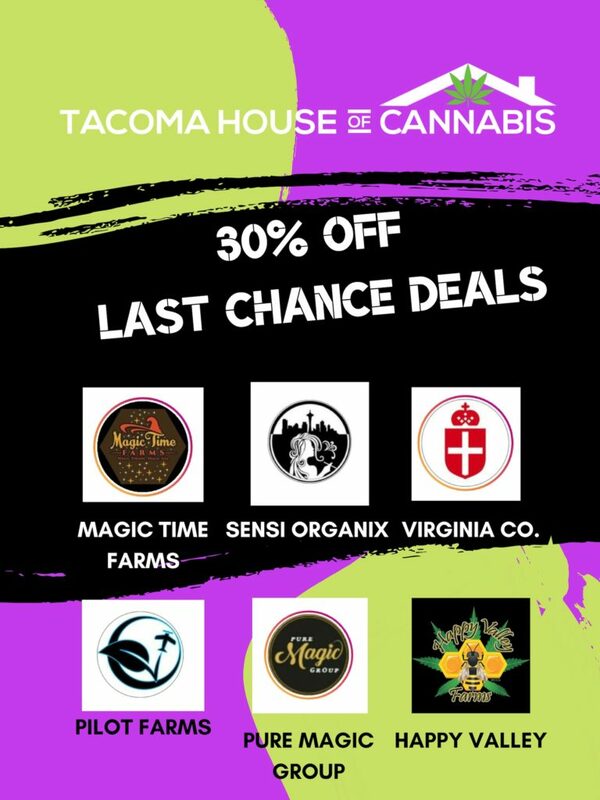 Bring your phone with you to the store and show our friendly budtenders your post, and they will apply a 30% discount to your purchase, TODAY ONLY. Due to State regulations with regards to selling marijuana items below cost, we will not be double stacking any discounts, and any items in the store already discounted beyond 30% from their normal list price will not apply to this offer. This offer is only good until 11:55PM on 02/28/2019. ## This product has intoxicating effects and may be habit forming. Marijuana can impair concentration, coordination, and judgment. Do not operate a vehicle or machinery under the influence of this drug. There may be health risks associated with consumption of this product. For use only by adults twenty-one and older. Keep out of the reach of children.This product has intoxicating effects and may be habit forming. Marijuana can impair concentration, coordination, and judgment. Do not operate a vehicle or machinery under the influence of this drug. There may be health risks associated with consumption of this product. For use only by adults twenty-one and older. Keep out of the reach of children. START YOUR ORDER FOR PICKUP, BY CLICKING HERE!